Made of 100% High Quality Silicone to protect your Nissan key fobs, remotes, and smart keys from marks, scratches, and other natural wear and tear, our selection of key fob covers comes in a variety of colors, buttons-covered or exposed, and even glow-in-the-dark features! Our key fob covers are extremely light, durable for use, and easy to clean. They will be a perfect fit to the Nissan line of remote key fobs and intelligent keys. For Nissan cars only, please compare images and styles to match your existing key fob pior to purchase. Product listings are for key fobs covers only! Remote key fobs and smart keys pictured are not included but may be bought separately. 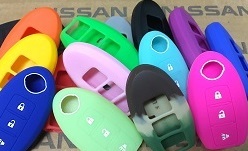 Please specify from the choices above what type and color of key fob cover you would like!